The good news is Yuri knows how to stop the asteroid–his research in antimatter will probably win him a Nobel prize if there’s ever another Nobel prize awarded. But the trouble is, even though NASA asked for his help, no one there will listen to him. He’s seventeen, and they’ve been studying physics longer than he’s been alive. Then he meets (pretty, wild, unpredictable) Dovie, who lives like a normal teenager, oblivious to the impending doom. Being with her, on the adventures she plans when he’s not at NASA, Yuri catches a glimpse of what it means to save the world and live a life worth saving. An asteroid is hurtling toward Earth! California will be decimated! How do you prevent that from happening? NASA calls all great minds to the United States for help, and one of those great minds is a seventeen-year-old Russian physicist prodigy. With only a few weeks, Yuri along with his American colleagues at NASA have to figure out a way to prevent the asteroid from hitting and causing destruction. Yuri has to deal with the stress of older physicists who don’t listen to his suggestions and people who watch him and keep track of everything. He manages to deal with that when he meets Dovie Collum, a normal teenager, and her family, where they introduce him to a life that’s so far from the one he knows. Get sent to California to help destroy an asteroid. When an asteroid is due to hit California, NASA calls on people who will prevent it from happening. Yuri flies over from Moscow to help calculate the best approach to moving the asteroid’s trajectory from Earth. He has a lot of weight on his shoulders, and it’s amazing how Yuri deals with it and being in a totally different country. Work with older physicists to come up with a plan. Yuri has to overcome hurtles that come in the form of American physicists. NASA puts these physicists into small groups where they’ll work out an aspect of the asteroid. (To cover more grounds.) Yuri has to work with two older physicists who are not keen to Yuri’s ideas. They think that Yuri’s plan to use antimatter to destroy the asteroid is a dangerous and implausible plan, and a waste of time. It’s too outside the box, but it may work if they could only see. The science is sort of easy to understand. Readers can see how persistent and confident that his idea will work, and feel his frustration at being treated like a kid. Win the Nobel peace prize for his work on antimatter. That’s all Yuri wants in life—to win the Nobel peace prize for his work in antimatter. Readers can sense how passionate he is from the way he speaks and calculate things. It’s what he’s being working towards all his life, and his work is being threatened by other people who don’t believe his work is plausible or are trying to steal his work. Despite these issues and the pressure, he doesn’t give up trying to persuade others, even when they don’t listen, which is super admirable. This teen will make his dreams come true. Failure is not an option. Make friends his own age. Yuri doesn’t exactly have friends. He’s an awkward teenager who spent most of his life working on antimatter and towards his Nobel Peace Prize goal, so he doesn’t have the best social skills. In comes Dovie Collum, who takes him under her wing and shows him all the things he missed out in his life like going to high school with teens his own age, prom, and family. I loved that Yuri got to see there is more to work than physics and antimatter—that even if the world is ending, he has met some awesome people who make it worth fighting for. 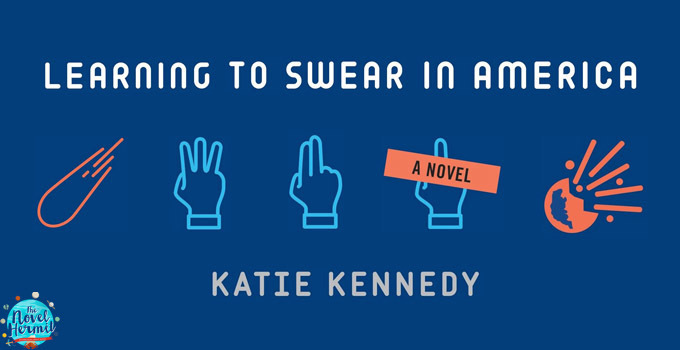 Should you read Learning to Swear in America? You should! You’ll want to know more about Yuri Strelnikov and his journey to achieving his goals and making new friends in the midst of an asteroid coming towards California. The book doesn’t really play up the tension of the asteroid coming towards Earth, but that’s totally okay. The writing, the way science is handled, and the relationships between the characters kept me riveted. When the asteroid comes hurtling toward Earth, you need someone like Yuri. That certainly is an interesting title! Does the mc end up swearing in the book?